The Soviet Union had long stuck to a system of ‘strategic parity’ of nuclear weapons development, sparing no effort to keep up with (but not surpass) the US. As long as it had the ability to retaliate against any US-initiated nuclear strike, it could more-or-less guarantee that such a strike wouldn’t take place (such is the brutal but compelling logic of ‘mutually assured destruction’). As discussed briefly in the second article in this series6, capitalism has a built-in advantage over socialism in areas of production that don’t directly benefit people. In a capitalist economy, an arms race creates demand (for high-tech weaponry), which stimulates investment, which creates profit, which keeps the ruling (capitalist) class happy, which in turn keeps its governments stable. In a socialist economy – oriented specifically to meeting people’s needs rather than generating profit for a small minority – an increased focus on military development requires divestment of resources from other areas of production – “diverting material and human resources from the civilian to the military economy, to meet the challenge of Western military pressure”.7 Given slowing economic growth, and given existing problems with food production, housing provision and light manufacturing, the arms race caused genuine difficulties. These served to make the ruling (working) class less happy and the domestic political situation less stable. Although western propaganda predictably portrayed the Soviet Union as a hostile, aggressive power, the Soviet government was in fact desperate to put an end to the arms race and to agree a stable detente. 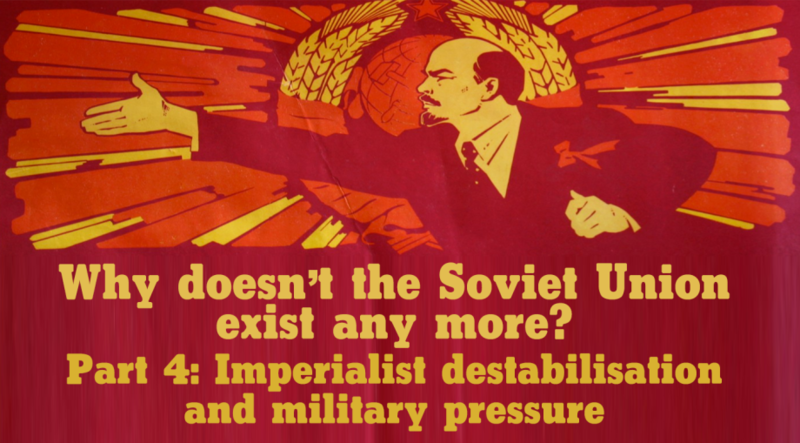 The USSR unilaterally committed to a no-first-strike policy, and put forward a range of disarmament proposals, including a two-thirds reduction of medium-range weapons by both the USSR and Nato. The defining moment of the arms race was Reagan’s announcement of the Strategic Defense Initiative (SDI) – ‘Star Wars’, an anti-ballistic missile system designed to prevent the possibility of nuclear missile attacks against the United States. Although not discussed in such blunt terms, its military objective was to disrupt the system of mutually assured destruction and strategic parity, allowing the US to freely engage in nuclear blackmail. An additional aim was to entice the USSR into developing a rival system, thereby further damaging the Soviet economy. In the end, Star Wars was abandoned – having had around $100 billion thrown at it. The US didn’t succeed in building a nuclear missile defence system on anywhere near the scale it had planned, but it did succeed in inspiring another round of frantic investment in military R&D in the USSR. Probably the most important element of the ‘full-court press’, however, was US support for the Mujahedin uprising in Afghanistan, which led to manifold economic and political difficulties in the Soviet Union. The revolutionary character of a national movement under the conditions of imperialist oppression does not necessarily presuppose the existence of proletarian elements in the movement, the existence of a revolutionary or a republican programme of the movement, the existence of a democratic basis of the movement. The struggle that the Emir of Afghanistan is waging for the independence of Afghanistan is objectively a revolutionary struggle, despite the monarchist views of the Emir and his associates, for it weakens, disintegrates and undermines imperialism. Good relations between the two countries survived the entire period of existence of the USSR. Although there were some ups-and-downs in the relationship – largely related to whether the Afghan administration under the extended rule of King Zahir Shah (lasting from 1933 through 1973) was leaning more towards the US or the USSR at any given moment – Afghanistan was generally considered a friendly neighbour, and its leaders had a vision of independence and national modernisation that the Soviet Union supported. From the mid-1950s onwards, Afghanistan was the beneficiary of significant aid, investment and preferential loans from the Soviet Union. Khrushchev and Nikolai Bulganin announced the first major development loan – worth $100 million – on visiting Kabul in 1955. In the ensuing decades, hospitals, schools, roads, irrigation systems, plumbing systems, factories, power stations and more were built (and sometimes operated) with Soviet assistance. Tens of thousands of Afghans were educated in Soviet universities. Faced with increasingly harsh repression by the state forces headed by President Mohammad Daoud (whom the PDPA had helped to seize power in 1973), the PDPA leadership made the decision to leverage its significant support base in the army to take power, in what became known as the Saur (April) Revolution. The Presidential Palace in Kabul was stormed on 28 April 1978, Daoud and his guards were killed, and the Democratic Republic of Afghanistan (DRA) was proclaimed, with veteran communists Nur Mohammad Taraki and Babrak Karmal as its president and vice-president. The proclaimed objective of the new government was to break the centuries-old grip of feudalism and to establish Afghanistan as a progressive, modern country – a tall order for a country that faced infant mortality levels of 269 per thousand, an average life expectancy of 35, a literacy rate below 10 percent and a primary school attendance rate of 17 percent.22 Stephen Gowans points out that “half the population suffered from TB and one-quarter from malaria.”23 Women in the villages faced total subjugation, were forced to wear the chadri (veil) and were denied access to education. Forced marriage, child marriage and bride-price were pervasive in the countryside. These changes weren’t to everybody’s taste. In the capital, Kabul, the PDPA’s initiatives won widespread support. The landlords in the countryside, however, were able to tap into a deep-rooted social conservatism in order to stoke up opposition to the government. Afghan central governments have always had limited control over the villages and tribes, and the more stable governments have enjoyed an uneasy accommodation with the countryside that consists largely of leaving it to its own devices. For a socialist government determined to break the back of feudalism, however, this wasn’t an acceptable option. Land reform, debt cancellation and gender equality should have been popular among the masses of poor peasants, but the landowners and mullahs had better access to these people and were able to convince many of them that the PDPA’s programme was a ruthless attack on Islam by godless urban communists. Faced with major outbreaks of resistance to government authority – most prominently the Herat uprising of March 1979 – the PDPA was forced to defend itself through heavy repression against the insurgents. Braithwaite estimates that “by midsummer 1979 the government controlled perhaps no more than half the country”. To make matters worse, the longstanding split within the PDPA between the Khalq (led by president Taraki and his minister of national defence, Hafizullah Amin) and the Parcham (led by vice-president Karmal) had deteriorated again after a period of tense unity. The leading Parchamites were despatched as ambassadors to various far-flung countries, and many lower-ranking ones were shot. Throughout 1979, the Afghan government made repeated requests to the Soviet Union to intervene militarily to save the Saur Revolution from a reactionary, US-backed uprising. Fearing a final collapse of their strategy of detente with the west – not to mention the possibility of upsetting their allies in the developing countries (“all the nonaligned countries will be against us”, predicted Soviet foreign minister Andrei Gromyko29) – the Soviet leadership was not at all keen to get involved beyond providing weaponry, advice and economic support to the PDPA. Vast quantities of money and weapons were channelled to the Afghan resistance via Pakistani military intelligence, who established training camps on the Afghan border, designed supply routes, and worked feverishly (albeit largely fruitlessly) to establish some unity between the seven major Islamist resistance groups. For the Soviets, the intervention turned out to be much more difficult than they had imagined. Their Afghan allies were divided and often demoralised; meanwhile their enemies were armed with sophisticated weaponry, had significant support among the local population, were fuelled by a vehement hatred of the infidel communist invaders, and were able to leverage Afghanistan’s mountainous territory to their advantage. Meanwhile the Red Army was not trained for a counter-insurgency war. The last major war it had fought was World War II. The war it was trained to fight was a defensive operation against a large-scale Nato land invasion and aerial bombardment. Fighting mujahids in mountain hideouts was a long way outside the Soviet generals’ comfort zone. The Red Army didn’t lose any of its major battles in Afghanistan; it won control of hundreds of towns, villages and roads, only to lose them again when its focus moved elsewhere. The US deployed increasingly sophisticated weaponry to the rebel groups at just the right rate so as to prevent the Soviet Union from either winning or withdrawing. Taking over as president in 1981, Reagan majorly stepped up US support for the Mujahedin, and from 1985 the weapons deliveries were increased by a factor of ten and came to include the famous FIM-92 Stinger infrared homing surface-to-air missiles. After several rounds of negotiations and failed attempts to get assurances from Pakistan and the US that they wouldn’t continue to pursue regime change if the Red Army left, the Soviet Union began a phased withdrawal on 15 May 1988. It had not been defeated as such, but it had manifestly failed in the objective of cementing PDPA rule and suppressing the reactionary uprising. Meanwhile, it had expended vast economic, military and human resources. Thousands of young lives were lost. Soviet diplomatic clout had reached its nadir. As the Soviets had themselves predicted, the intervention in Afghanistan weakened their position among the developing nations: “The Soviet entry into Afghanistan divided the NAM states. It weakened their bloc in the UN, where eighteen countries (led by Algeria, India, and Iraq) refused to go along with the US resolution asking for the Soviet withdrawal.”37 Furthermore, the tens of thousands who came home badly injured from Afghanistan mostly found that they weren’t well cared for in terms of housing, pensions and psychological support; their fallen comrades were not, for the most part, given a status befitting their internationalist mission. This correlated with the expanding anticommunism and nihilism of the Gorbachev era. Beyond the direct economic impact, the Afghanistan war served to further undermine Soviet self-confidence and the popular legitimacy of its government. The reality is, as ever, more complex. The Afghan war was just one of several factors in the Soviet collapse; after all, the US sustained a comprehensive and shameful defeat in Vietnam, but this didn’t come close to bringing about its collapse as a political entity. The economic decline, the leadership’s attack on Soviet ideology and history, the ongoing process of destabilisation and disinformation: these were all more important contributors to the disintegration of the USSR. But unquestionably the Afghan debacle played its part. The next (fifth) article in the series will examine the rise of Mikhail Gorbachev and the role that his policies of perestroika and glasnost played in weakening and ultimately destroying Soviet socialism.